My Uncle Ed is my dad’s oldest brother. The exotic one. The world traveler. He worked for years in the oil business, going to many an exotic place like the Ivory Coast and Libya — really, anywhere there was oil in the ground and they needed some guy to come visit the rigs and say, “Yup, keep going.” He was our bachelor uncle who brought us back bracelets from Kenyan marketplaces, silk shirts from Japan, and jade necklaces from China. He had pictures of he and President Reagan shaking hands at a dinner. He talked a lot about having dinners with ambassadors and royalty. When my parents divorced, my uncle asked my dad to move in with him and found him a job in the oil fields, too. Our summers were spent in California, visiting these two big kids who would send us out of the condo so they could play with liquid mercury (“Look how it forms into balls!”). As two engineers, they also loved heading up to the gold mine in Montana with pick-axes, dynamite and rifles. Then along came my aunt. To call her a nutcase is to put it mildly, but he loved her, and my dad especially put up with her erratic behavior for the sake of family. The rest of us sort of left the room when she entered because we were never sure what might set her off. 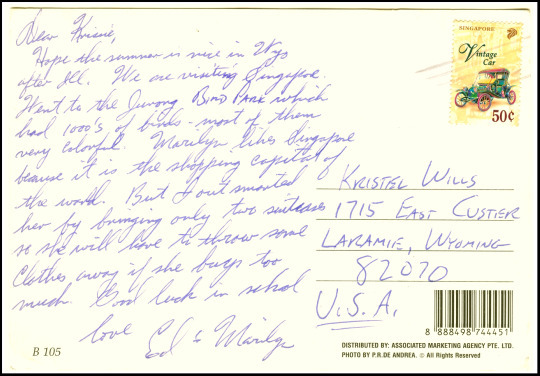 I’ve never been particularly close to my uncle who spent most of his life overseas (you’ll see that he spells my name “Kristie” here). 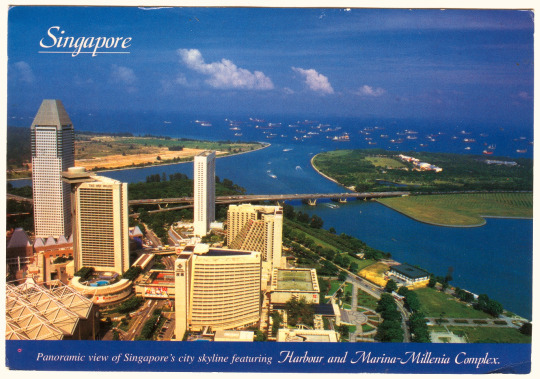 It came as a surprise to find a few postcards in the storehouse from him, one from Morocco and this one from Singapore. Almost two years ago, my uncle had a stroke while on a plane in China. He was touring the country with my aunt and he was rushed to a hospital where he stayed for about six weeks until they were finally able to transport him back to the United States. Since their return, my aunt has isolated herself and him, so no one really knows his condition. We think they’re in Oregon.